I have been reading In Defense of Food recently. How I didn’t read this a few years ago when everyone else was reading it I am entirely unsure, but the point is that I have finally gotten around to it. If you haven’t read it, you must. It is a reminder of how much work there is to be done when it comes to the food system. A good culinary reality check so that none of us rest on our laurels. There’s a lot at play here, but essentially it comes down to this: In American culture we’re not always taught to enjoy food. We don’t find pleasure in it, and if we do, we immediately beat that pleasure down with the guilty stick. This is of course a bad policy, and while you shouldn’t be eating chocolate cake for every meal, every day, not being able to find the pleasure in indulgence is just as “bad” as the negative effects that chocolate cake may bring. I happen to always want chocolate. Always. And, there’s something that’s very very difficult to resist about the specific combination of chocolate, fat, and salt that comes from brownies and chocolate cakes. But, I wanted a chocolate-something-or-other made with a nut base (flourless! 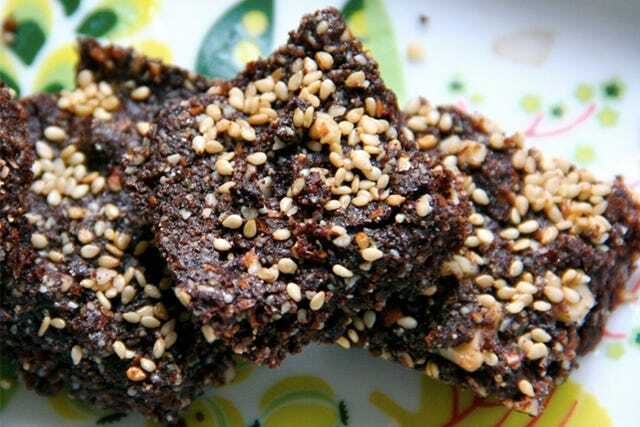 ), and because of a recent effort to overload everything I eat with extra nutrients, not only did these get made with sesame seeds and almonds, but I also went over the top and added in some almond butter. I know what you’re thinking: “Oh no, another 'healthy' brownie that’s just going to taste like sawdust and want me craving an actual brownie.” I challenge you to try these. I literally almost ate the entire batch in one sitting — which I would not have guilt about in the slightest. Call them brownies with a punch. They’re chocolatey, oily, and salty. And, you should definitely think “celebration” when you eat them. In a frying pan, dry toast the sesame seeds until they get a golden brown color. In a food processor, grind the sesame seeds and almonds together until almost finely ground. Whisk together the egg and the sugar, then add in the olive oil and almond butter and stir together until well blended. Depending on how hard runny your almond butter is, you may want to do this with a fork. Carefully stir in the cocoa powder (I say “carefully” because it has a tendency to go everywhere). Add in the ground almonds, sesame seeds, and salt and stir the entire batter together. Lightly grease an 8-inch, square baking pan with olive oil, and press batter into the pan. 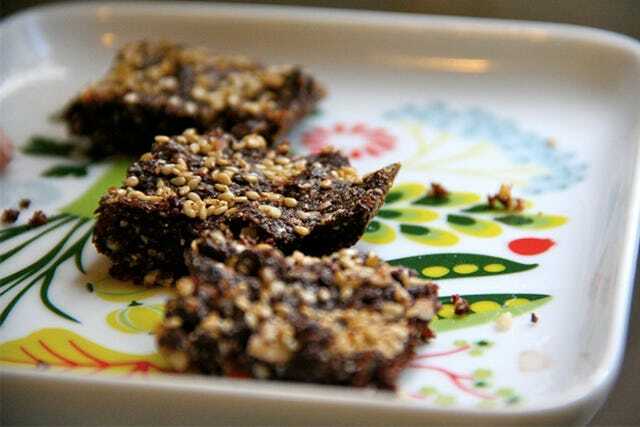 Sprinkle sesame seeds on top for decoration. Full disclosure: I don’t own a square baking pan, so mine gets made in two rectangular pans. You make do with what you have. Bake at 400 degrees for 15 to 20 minutes. The batter should be set and feel like it has a hardened crust if you poke it. The olive oil will bubble up. Don’t worry about it. Remove from the oven and let cool. Cut into squares and serve.